Last Friday, the Philippines has been struck with Super-typhoon Haiyan or Yolanda as we Filipinos call it. It brought sustained winds of 235km/h (147mph), with gusts of 275 km/h (170 mph), with waves as high as 15m (45ft), bringing up to 400mm (15.75 inches) of rain in places. With many roads impassable, no power, and no phones, we still don't know the exact extent of loss and devastation it has left us. But one thing, I know. Lives have been lost. People have been hungry and thirsty for days. They have lost their homes, their belongings, and endured the most terrifying situation of their lives. I live in Manila, and we had been fortunate to be spared Yolanda's wrath. I am grateful to be alive, to have a roof over my head, food, clothes, and my loved ones well. I realize everything else is gravy. Yet, there is a huge knot on my throat. Every time I see on TV or the internet how my fellow Filipinos are suffering, I want to cry. For the past two days, I asked myself what I can do. Yes, I had gone through my clothes, my bedsheets, my towels, and picked out a few I can donate. I don't have much funds to donate, so I was thinking a fundraising will be good. But I asked myself what can I do as a food and travel writer. With several deadlines to meet and an upcoming at the end of the week, I can say there is nothing I can do. "It's too bad, I'll be in Indonesia," I thought to myself. I can't pack or put together a fundraiser. But I realized I too was away when Ondoy struck, I was living in Singapore then. Right that very moment, I could only pray. But a few weeks later, my Filipino friends at St Francis Xavier Choir and the Religious of the Cenacle sisters mounted a recollection/concert to raise funds for Ondoy. Through faith and song, we raised money for our fellow Filipinos in need. I do know what it feels to be away from your countrymen, feeling helpless, and wanting to help. I realized there is something we can do. I call it ADOBO AID. 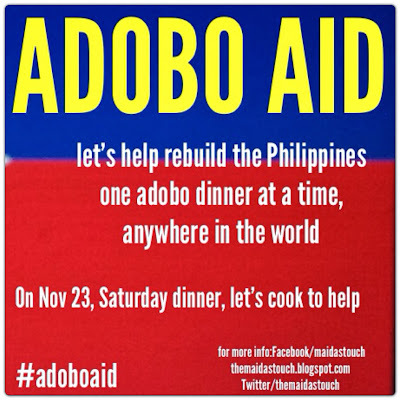 Our national dish is Adobo. It is a resilient dish. With vinegar, it does well without refrigeration. It does not spoil easily, and can keep for days. In fact, it even tastes better the longer it stays in your freezer. So here's what I propose to the over 10 Million Filipinos, living all over the world. 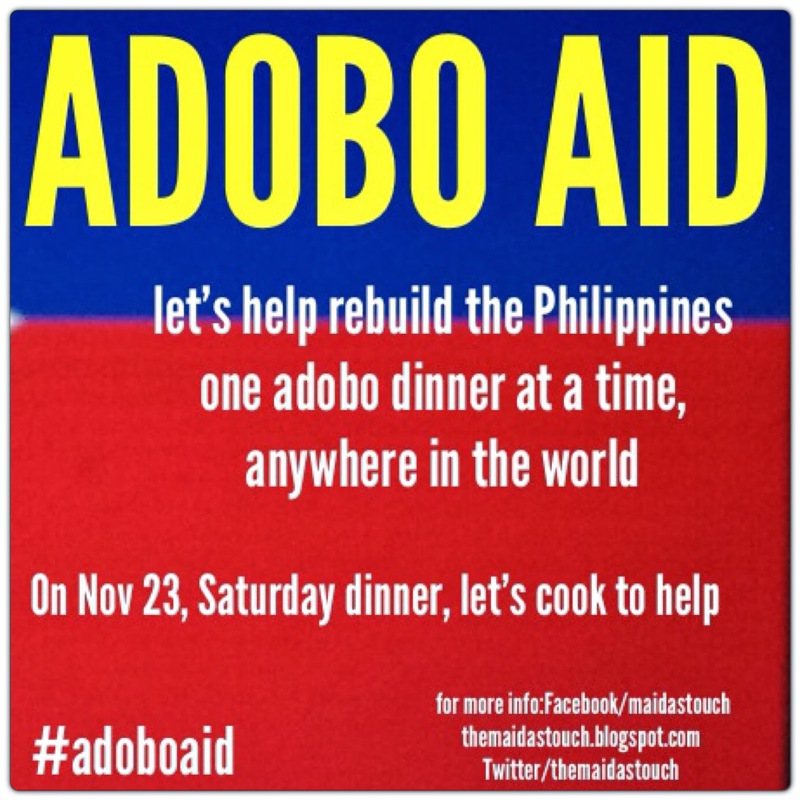 Come join me on NOVEMBER 23, Saturday, dinner. Invite your friends-- Filipinos and non-Filipinos alike! Cook a simple dinner of your favorite adobo recipe. 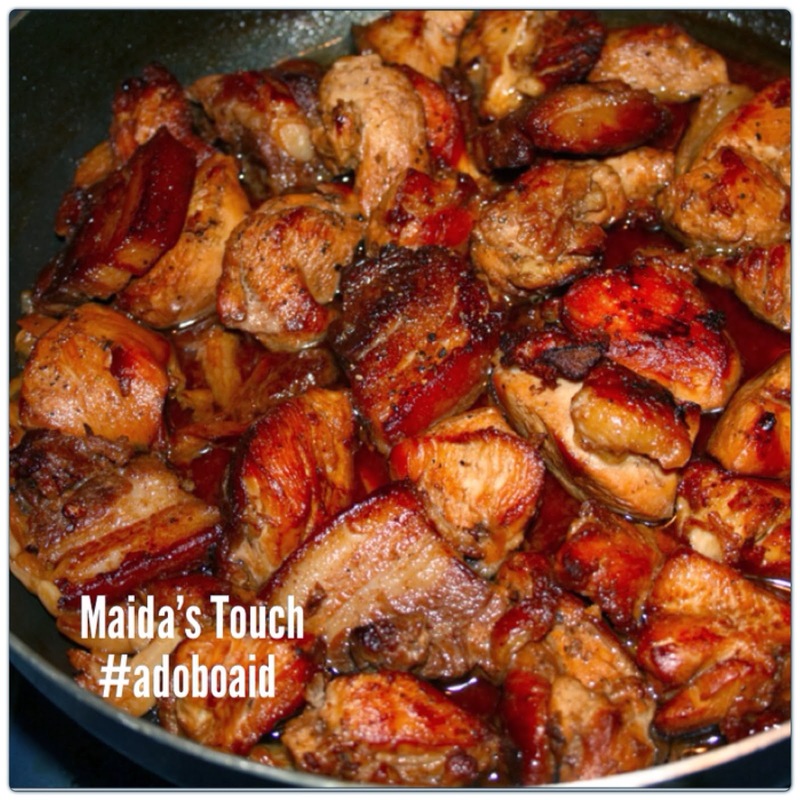 It can be pork and chicken adobo. It can be adobong pusit, or if you can't cook even adobong mani will do.